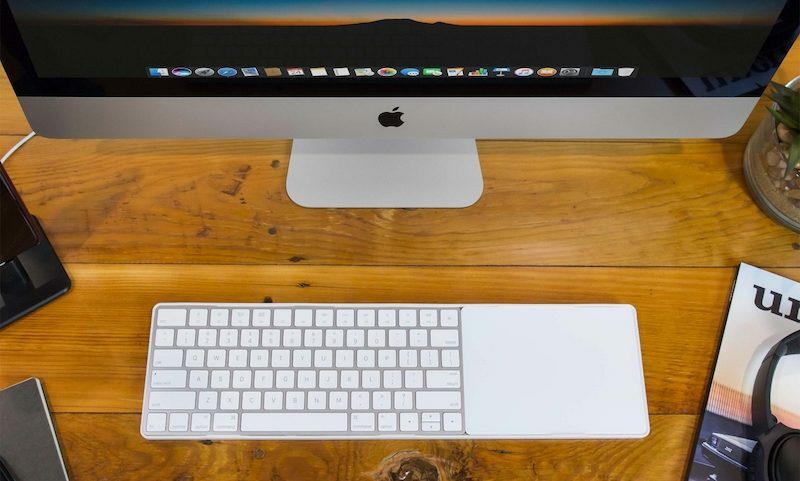 Twelve South today launched the "MagicBridge," an accessory that combines Apple's Magic Keyboard with a Magic Trackpad 2 into one connected control surface, letting users "type and swipe more efficiently," according to the company. The versatile accessory supports orientations for both left-handed and right-handed users. MagicBridge has cutouts in the back for the on/off toggles and Lightning connectors of Apple's typing and trackpad accessories. The MagicBridge itself is made up of white polycarbonate to match the Magic Keyboard and Magic Trackpad, with silicone pads on the inside to protect each when they're placed in the frame of Twelve South's accessory. Ever notice the Wireless Keyboard & Trackpad 2 look like they were supposed to go together? By connecting these profile twins, you’ll create one larger keyboard that’s much easier to use than the smaller pieces by themselves. Also, when your trackpad is predictably beside your keys - you can find it with your fingers without looking down. Touch-typing is now Touch-tracking. Cleaner, faster, more stable control. Now that’s magic. The MagicBridge is an update to Twelve South's previous device, called the MagicWand, which connected the original Magic Keyboard and Magic Trackpad and provided a steeper angle for typing. Users interested can purchase the MagicBridge today from Twelve South's website for $34.99. Stupidest thing I've ever seen. Amazing, somehow I've managed to keep my trackpad and keyboard side by side for over a year without this plastic tray. Must be some kind of sorcery. "type and swipe more efficiently"? What an overstatement for a piece of plastic! What an overcharge for a piece of plastic! 35 bucks for a hunk of plastic? I would rather borrow someone else's 3D printer and make it myself! Good lord, TwelveSouth has some big balls. Or just get a sheet of plastic that's smaller than the size of this thing, put some double-sided sticky tape on it and place the keyboard and the trackpad onto it. This solves a problem for me, at a price point I can afford. I went ahead and ordered one. I have other Twelve South products, which are pretty good, and I support them as a company. Doing what they're doing takes intelligence, creativity, experience, and guts - I think they should be applauded for what they're doing, even if this isn't a product that you'd like to purchase. To the trash talkers, try inventing something, manufacturing it and bringing it to market before disparaging somebody else's efforts. Or as Steve Jobs said, "What have you done that's so great?"